Pictures are much better at showing what we have experienced so far in Norway. 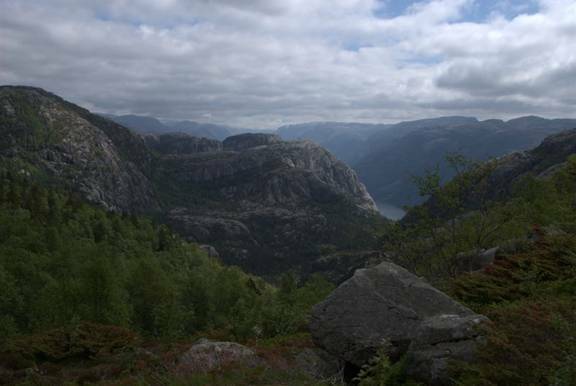 We encourage you to look at our annotated photo gallery, Southern Norway. General Impressions: This is a beautiful country with mountains, some with snow, clear blue water, steep rock cliffs that plunge into the sea and continue as underwater mountains, waterfalls, and glaciers. The countryside is quite spectacular. Every day the words “spectacular,” “magnificent” or simply “WOW” are spoken many times. Birds seen: Eiders, Mallards, Canada Geese, Oystercatchers, gulls & terns & swans, Shelduck, Graylag Geese, Red-breasted Mergansers. We heard cuckoos. The eiders are an interesting bird; they seem to travel in communes with lots of wee chicks and 5-12 adults supervising. Fish caught: cod, whiting, and crab. Four footed and otherwise: Sheep with mum’s belled and lambs bleating. One place had belled cows. Weather: Cold, N winds/gales. Even the Norwegians complain that this has been a terrible spring and early summer. When it is not a gale, the wind is calm. This means we have had few days of sailing. When we sail, it is often motor-sailing. In the fjords the wind is impossible to forecast since the steep mountains funnel the wind in the most unpredictable ways. Norwegian boaters: Aggressive when entering a harbour if you are in front of them and when they think you may get the best spot. They are much more aggressive than Americans; it must be the Viking blood. They have little respect for speed limits in harbours. They tend to ignore foreign boats and boaters. In general Norwegians are not interested that a Canadian yacht is in their waters. They look the other way when we wave at fellow-boaters, and do not stop to talk. In Bergen, many folks stopped to talk to us, but they were all from cruise ships docked in Bergen for the day. Very few Norwegians stop to talk and the few that do usually have a Canadian connection. 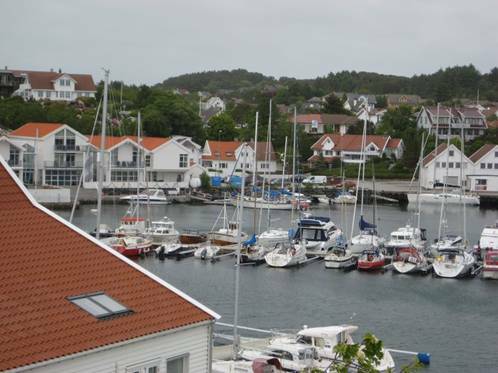 Norwegian Marinas: Charge for full service (power,water,WC,showers) and don’t deliver on most of the items (out of order, locked up, no longer available). Extra charges apply to everything. The concept of service does not seem to have made it into the Viking mind. The major exception was the harbourmaster in Arendale. What we see a lot of: Ferries, bridges and tunnels. With so many islands and deep fjords cutting into the shoreline, these are mandatory. Fortunately most of the bridges are high enough to accommodate our mast. Fish farms. These operations are very large. The area for the fish is often covered with huge net umbrellas, and usually a large boat (like a small processing plant) is anchored at the farm. Unfortunately the fish are prisoners; few seem to escape, and none is interested in Brian’s lure. Oil rigs / supply ships. Small platforms are in the coastal areas, and there are specially designed supply ships to deliver goods to the people who run the platforms. Powerlines, strung high above the fjord with towers that march down the mountains. 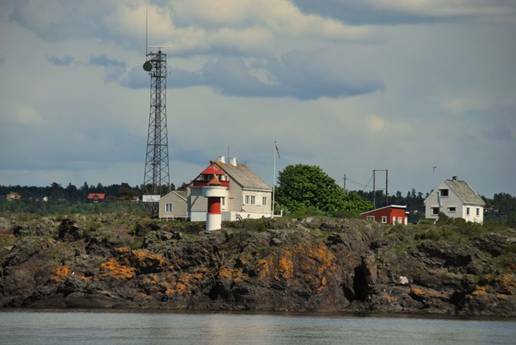 Hvaler Islands are a small archipelago SE of the Oslofjord. It was our first Norwegian anchorage and kept us secure during our first northerly gale on May 24/5. 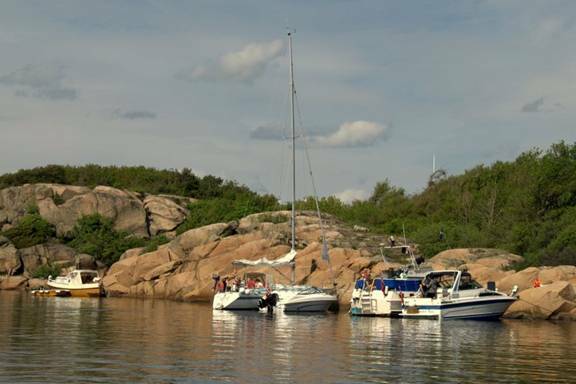 It was the end of a long weekend for Norway, so the Norwegian boats were out in swarms, both in Stromstad, Sweden, and in the Hvaler anchorages. When we arrived at 2:30 there were approximately 100 boats along channels and pools in this area. As the wind built and rain threatened, the boats left, until we were the only boat left. 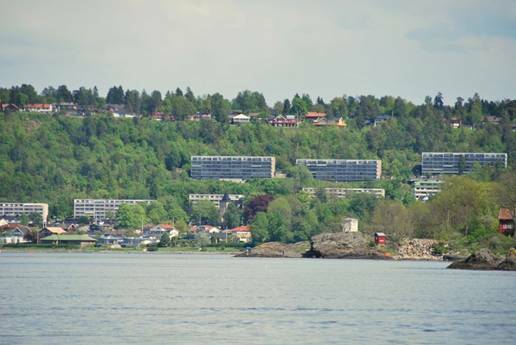 Oslofjord is 70 miles long running north/south. Oslo is at the head. We motored in calm, sunny conditions about 2/3 of the way up the fjord. About 5 miles before we reached our anchorage, we encountered 20 knots of wind from the SE, so we had a wee bit of a sail. Most of the day was sunny, but there were rain clouds and we went through a downpour (but alas, no rainbow). We were boarded by the Norwegian Customs / Immigration officials, who were very interested in our journey, polite and even stamped our crew list to verify we have been out of the EU (for VAT tax reasons this is important to us). Sandpollen is a great anchorage. 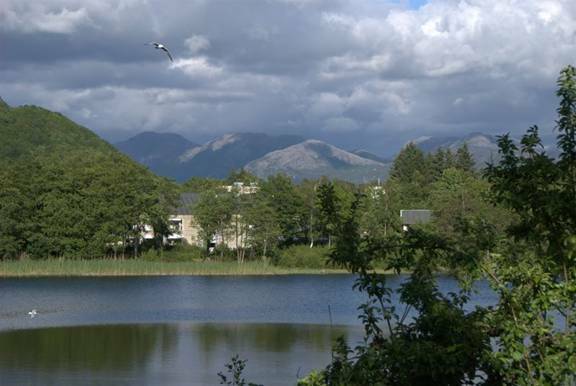 It is a little pond off the fjord, very popular in summer but quiet this time of year. During dinner we were visited by the resident swan and an Eider commune; we saw a heron and a number of quarreling oystercatchers, lots of terns and gulls. 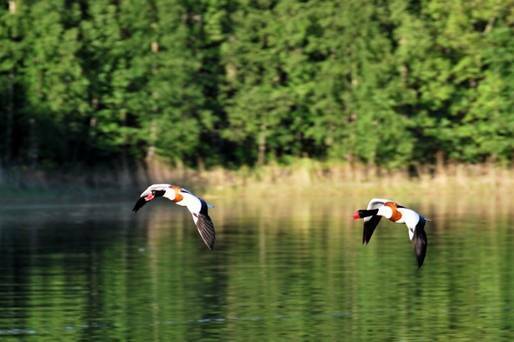 After visiting Oslo we stopped at Sandpollen a second time and were entertained by Shelducks competing for territory. We heard the belled sheep (Belled Baas) but could not see them as they wondered the shoreline looking for grass and water. A Norwegian powerboat that sped up around us in the harbour to grab the last mooring ball turned on their engine so they could watch TV while we watched the Shelduck drama. Oslo. We stayed at the Royal Norwegian Yacht Club. This is not up to the Canadian (well, really British) “royal” standard. Far from POSH. 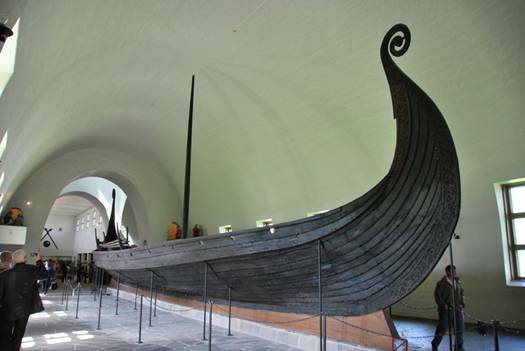 But it is close to the city by ferry, and very close to 4 museums: Viking Ship, Maritime, Fram (Arctic/Antarctic expeditions) and Kon-Tiki. We discovered the single washer at the yacht club worked; the single dryer and water extractor did not, so our boat was draped with damp clothing. We spent one day in downtown Oslo. Both of us were suffering from bad colds, which may have coloured our impression of Oslo; we were not impressed. Oslo is like Helsinki. 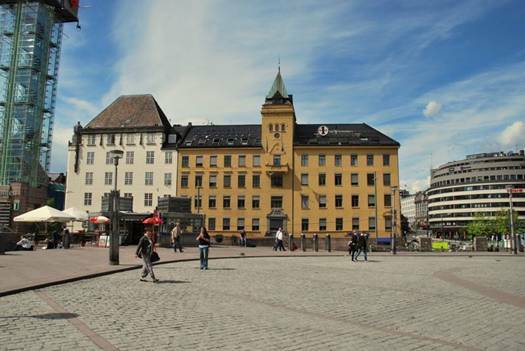 There is little from the 19th century and earlier, so it lacks the Baroque and classical architecture we saw in Stockholm and Copenhagen. Had we been well, and had the weather been warm and sunny, we may have given Oslo a higher score. 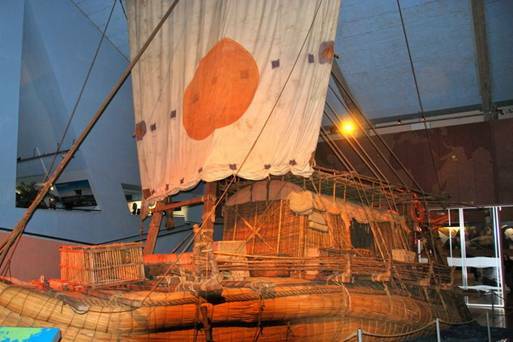 The Kon-Tiki and the Viking Ship Museums were fascinating, and had we felt better, I’m sure we would have enjoyed the Fram and Maritime museums as well. Our selected anchorage was about half a mile from Risor, a village that still builds wooden boats. It was touted as a favorite, but when we squeezed into the small pool, with a 3-foot rock in the centre, we realized that the only way you could anchor here was to stern-anchor with a line to shore. We did a quick re-route to a second anchorage that was described as “dark and gloomy.” It was 2 miles down a small fjord, with an entrance to a bay that was about 50 feet wide. Once inside our anchorage bay, we were stunned with the beauty. 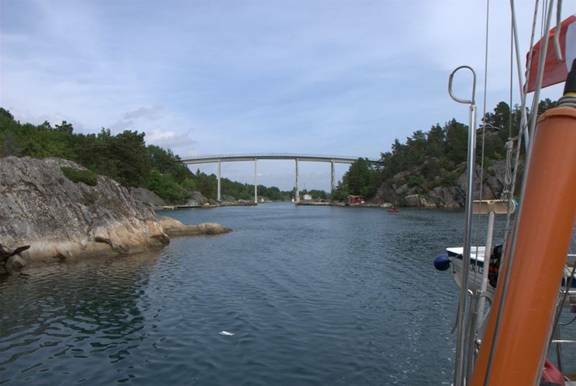 Blindlaia is an 8-mile channel, sometimes only 20 feet wide, through an archipelago that is lovely. There was one bridge with 19 meters of clearance (our mast is 18 meters above the water plus VHF antenna), and it was high tide (6 inches only, so not an issue). We motored through the channel and except for 3 really tight sections it really was more beautiful than scary. This channel is very busy during “high season” but we only saw 10 outboards underway and two sailboats passed us after we anchored. We anchored in a bay that used to house a pilot station and lookout. Birdlife included the usual swan duet that had learned to beg, some Eiders, a black-backed gull on a nest, and Oystercatchers. We took the dinghy out for a row around the bay. We saw lots of broken shells from mussels and other shellfish on the bottom, and periwinkles clinging to the cliffs. A fisherman was working the area just outside our anchorage, so when he left, Brian went for his first real fishing trip. 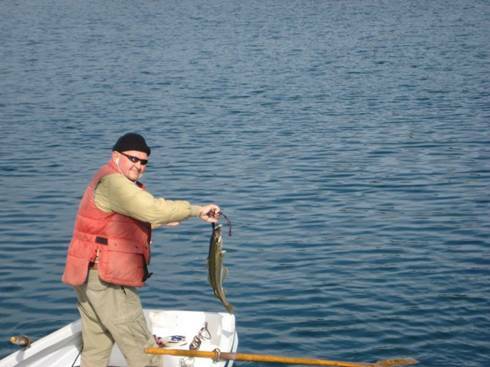 He managed to catch two night’s worth of dinner: a whiting (related to cod) and a cod. 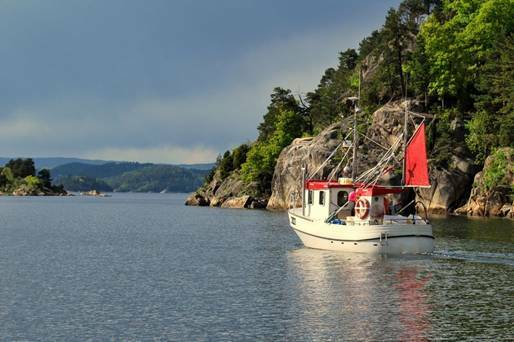 This anchorage is a group of rocky islands with just a bit of vegetation, on the far southern edge of the archipelago at the SW tip of Norway. We anchored in 40 feet with a sand/weed bottom. 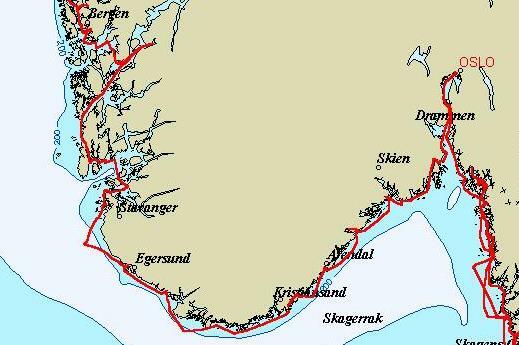 Up until Norway, 35 feet was our deepest anchorage; in northern Norway, the acceptable anchorages get even deeper. There was a strong tidal current, to add to the complication of anchoring. The anchorage is supposed to be a bird sanctuary. We have seen 3 nesting black-back gulls, but no other birds. 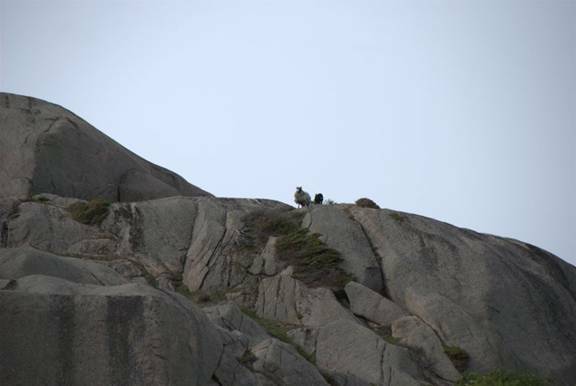 However, perched high on the rock island next to us (about 200 feet up) are 5-6 very shaggy sheep. They stand close to the edge on the highest peaks with heads pointed into the wind. 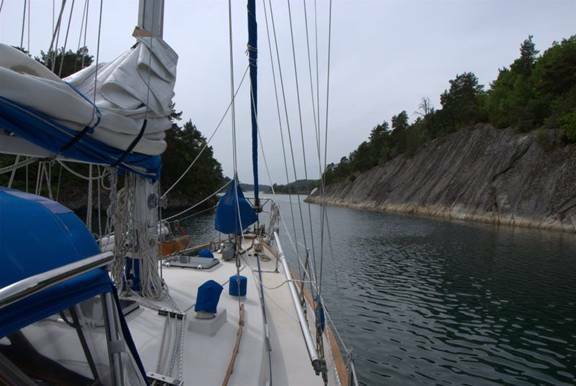 This anchorage is at the end of a mini-fjord, only 1 mile long. There are cottages, a dock and moorings at the entrance of the fjord. We went to the very end, through a channel that was 20 feet wide and 14-19 feet deep into a small pool. On two sides the rocks rise about 400 feet straight up out of the water. On one side is an island, about 100 feet high, and behind us the mainland drops to about 100 feet high. Our bow is facing a rock-strewn channel. Our description and pictures cannot do this justice. Norwegian weather is amazing. We woke up at 6AM and hauled anchor at 6:15. 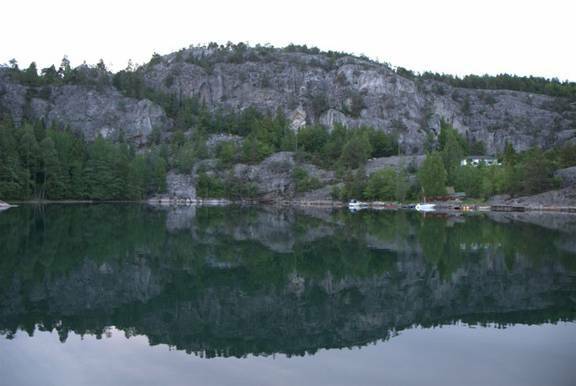 The air was so calm the magnificent shoreline was doubled in the mirror-smooth water. We motored out the channel and set our course for Sirevag, the last port for 30 miles before Tananger. When we got to Sirevag at 7AM, the wind was still calm, but the sky was threatening. We decided to continue on for the next 30 miles knowing we could always turn back if the predicted wind became too strong from the NW. However, we decided to change our course off the rhumb line to one that took us further west, so we would be better positioned if the wind did increase from the NW. By 8AM the wind was evident, but not a concern. By 9AM it was over 12 knots. We hoisted the staysail and mizzen and motor sailed. The sails gave us a good 1.5-2 knots on our speed, but the waves (3-6 feet) were killers. We averaged about 5 knots for 16 miles. By 10:30 we could change our course to NE, and the wind was up to 16 knots and the waves less pounding. Our speed increased to 6.5 – 7 knots. There were plenty of cargo ship traffic to keep us on our toes, with the occasional fishing marker to watch for. Overcast skies finally turned into rain. As we got to Tananger at 2PM the wind was hitting 22 knots. The calmer seas and wind in the port was truly welcomed. We docked at the Hummer Hotel in the lee of the building. We stayed two nights at Tananger while a NW gale over 35 knots hit the SW coast of Norway. Pilgrim (centre) at the hotel docks … advertised free newspaper and breakfast is no longer offered at least not to us. The crab trap did provide dinner. We saw our first of several oil platforms after we left Tananger near Stavanger. We thought they were all out in the North Sea, but there are some small ones in the coastal waters. Tau is mainly a ferry terminal. The only industry is a large mill. There was evidence of sluiceways from former times when waterpower ran the mill, and there were some millwheels and old grinding cabins over the sluiceways. We were trying to translate what grains were milled, and a worker noticed us. In addition to wheat, rice and oat cereals, the mill produces pea grain products for fish farms and they get the dried green and yellow peas from France and Canada. He told us to visit the Mill Park which included an inland, gorgeous rhododendrons up to 8 feet high, a teahouse pavilion, a hothouse, and an art studio / gallery with paintings, sculpture, and very beautiful clothing. The view from the tea pavilion was magnificent. 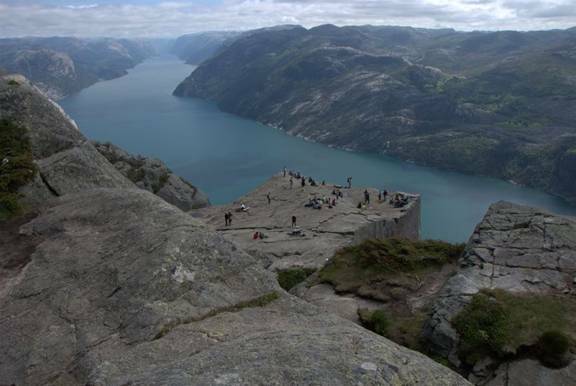 We took the local bus for the 35 minute ride to the youth hostel at Preikestolen, Pulpit Rock. From the youth hostel, the signs indicated that the hike to Pulpit Rock would take approximately 2 hours. 2 hours if you are a Norwegian who barges along as sure-footed as a mountain goat. The ascent began with a gravel road that rose at about a 40 degree angle. In some respects, it was the hardest part of the climb, since the gravel was loose and footing was slippery. 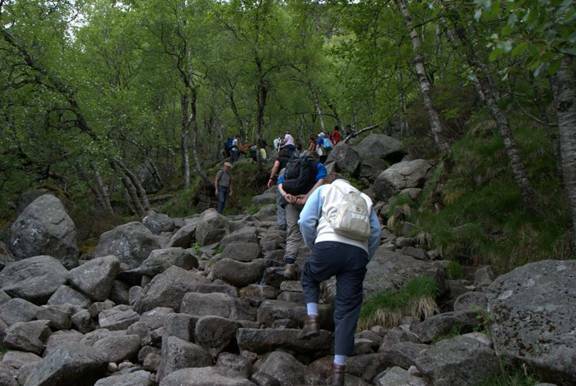 The road quickly became a very well-marked path of boulders. Sometimes the hills were steep and somewhat difficult. At other places the ascent was gentler, but we were still balancing on boulders, most of which did not move when we stepped on them, but occasionally they did move…. 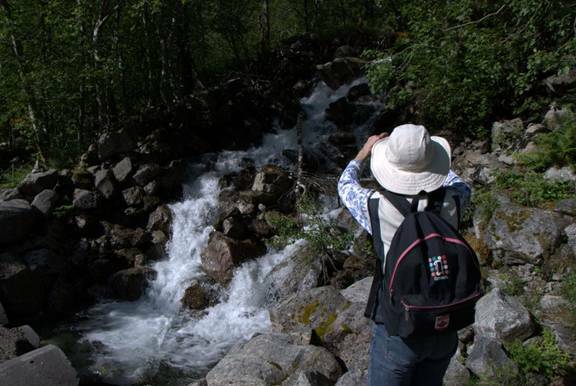 Sometimes you could hear the rush of water (a little mountain brook) flowing below the rocks you were walking on. 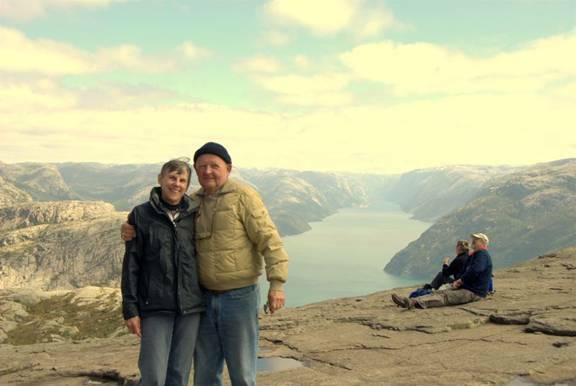 When we became breathless or the heart started pounding to fast and loud, we stopped and the views of the Lysefjord were spectacular. There was plenty of cloud, but some sun, which made the views dramatic. We ate lunch at the summit. 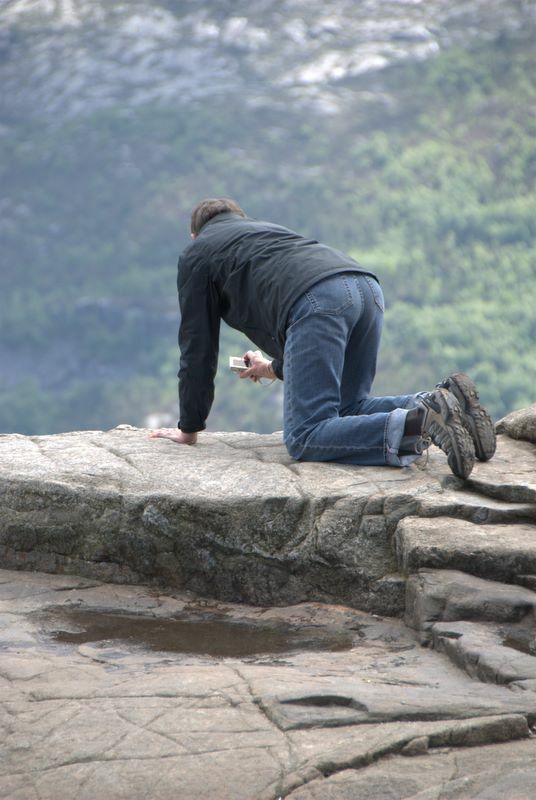 Then Jane went to the edge to lean over (actually I was lying down or kneeling, so there was no danger of falling the 604 meters to the fjord below). We took the cliff path back down the top ascent. There were places they had put up chain railings to ensure we did not slip down the cliff if we lost footing. The descent was much harder on the knees and legs than the ascent. By the time we got back to the bus stop, our legs and knees were aching. When we got back to the boat at 4PM we just lay in the cockpit while the pictures downloaded from our cameras to the computer. The smile at the top… now where is the hand glider to get down? Hardangerfjord is a large fjord with many smaller fjords branching out from it. 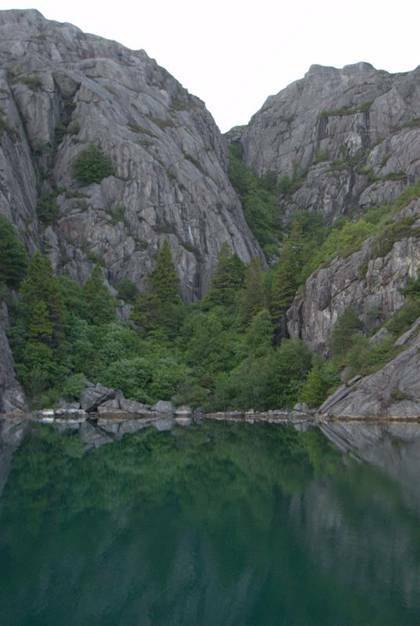 Maurangsfjord is relatively short and narrow. As we approached, the narrow opening and steep sides were awesome. 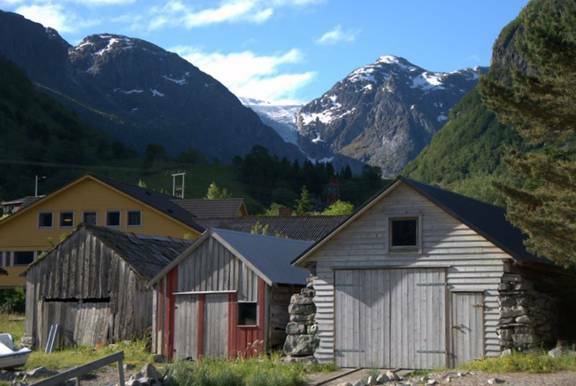 We found Sunndal, which is a very small community catering mainly to campers and RVs. This is a great area for hiking, especially with the glacier. We could see one of the fingers of the glacier, Bondhus, from our dock. Needless to say, a hike was in order. First up a paved road to a car park, then on a gravel road (wheelchair and stroller accessible, but just barely) for 1.5 miles to the lake. The walk along the rushing river with roaring falls was spectacular. The water was so clear, and where pools formed we could see small fish. Along the way we also encountered sheep: Mums with sheep bells and children close by. 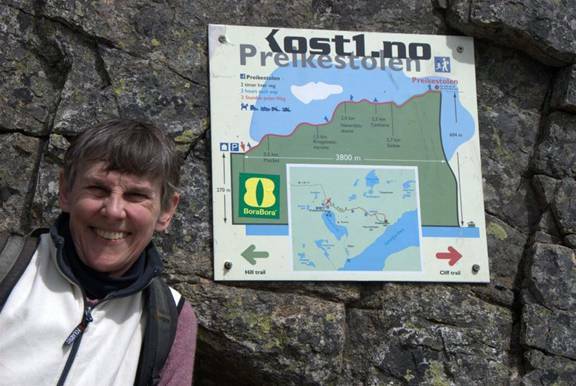 By the time we got to the lake we were 189 meters above the sea. The lake was beautiful. Calm and clear in some places with smears of pollen floating near the shore. There were several picnic tables made from slabs of stone. The gravel path gave way to a stone and boulder path with a relatively gentle incline … nothing like the Pulpit Rock climb. We passed a waterfall cascading down the mountain cliff from a lake 800 meters above sea level (a 600 meter drop) we crossed the waterfall over three separate bridges. The wild flowers, ferns and moss were lush. We walked halfway around the Bondhus lake to a moraine where the glacier tongue used to extend in the late 19th century. Then there was an ice road and blocks of ice were carved from the glacier and carted to houses to provide refrigeration. Now this moraine is a huge sand and rock deposit on the side to the lake. We continued on the path for another half mile and had a good view of one finger, but it has receded significantly during the past 6 years. Our German cruising friends took the more challenging path; it led closer to the glacier tongue, but not onto the glacier itself. 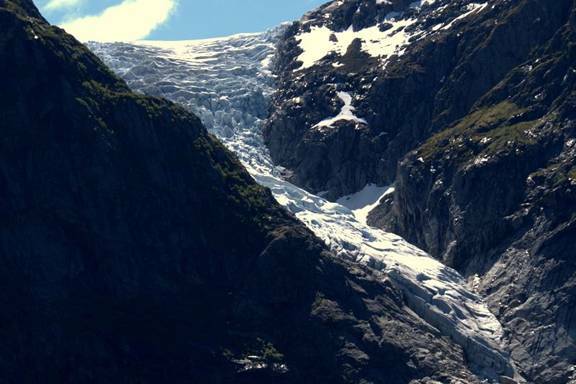 An experience guide (and probably some good equipment) is needed to hike on the glacier. Their hike was estimated to take 6 hours, but it was longer than that. 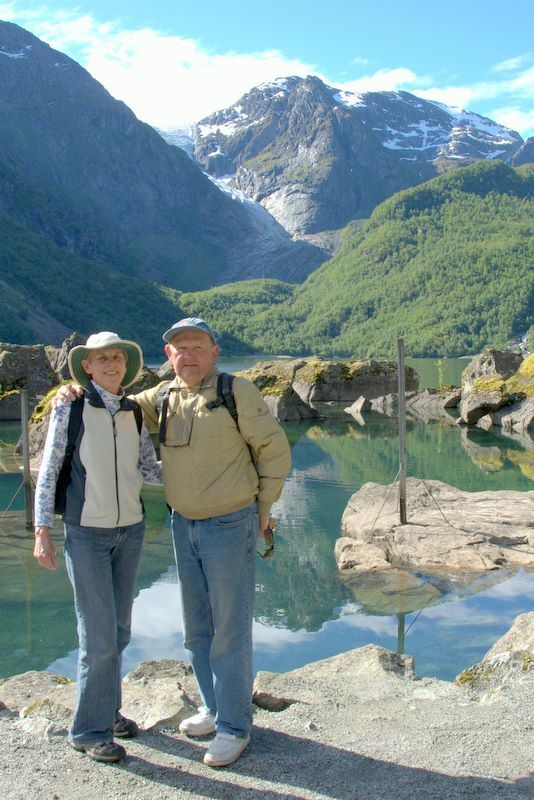 We met them later in Bergen and they showed us their pictures of their hike. We had our first glimpse of Fjord horses. 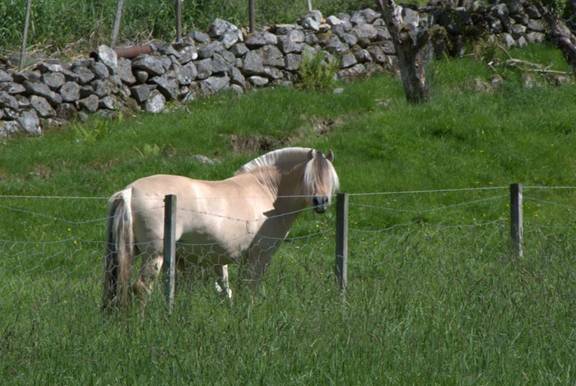 These are a special breed of horse for farm work in the fjords. Not as tall as a normal horse, they have a very short mane and are heavy-set. One mare and her nursing colt were in a field near the boat. Bergen and our trip north will be covered in our next log entry, Northern Norway.